I use glossaries-extra to typeset the list of symbols in a book I edit. Since the book is large, the list of page numbers for each entry is long, making the whole glossary occupy too much space. I wish to reduce this space by typesetting the page numbers using \smaller or \textsmaller and reducing unnecessary vertical gaps. As you see, only the size of the digits is reduced. How to reduce the font size for each page-number list as a whole (including the commans and the spaces)? 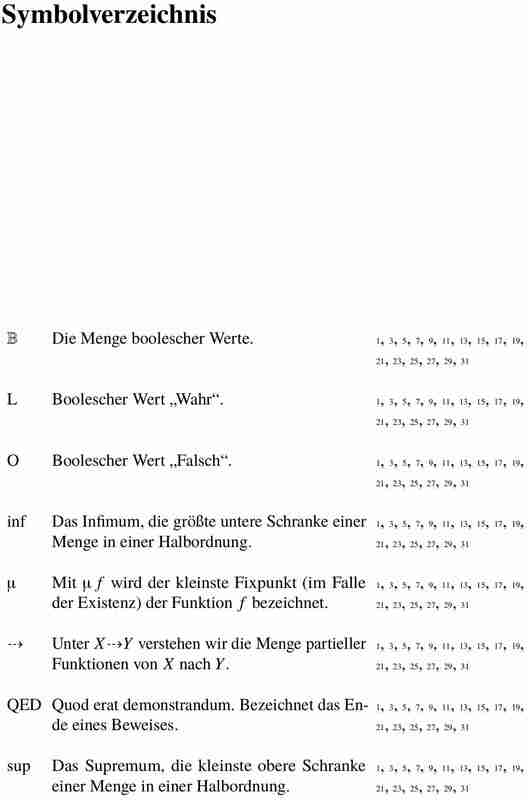 How to remove the vertical gap between the glossary title (here: "Symbolverzeichnis") and the first item of the glossary (here: "𝔹 Die Menge boolescher Werte ... "). The glossary is a longtable which inserts a space before. This space \LTpre can be changed. Not the answer you're looking for? Browse other questions tagged spacing fontsize glossaries-extra relsize or ask your own question. fncychap package - vertical gap/space between text and heading too large - how to reduce? How to make a list of abbreviations, acronyms, symbols, glossary and index with the glossaries package?